Have you been involved in a Motorcycle Accident in New Jersey? Need help dealing with the insurance company? Birkhold & Maider Attorneys At Law are experts in New Jersey Motorcycle Accidents. Motorcycle riders are uniquely vulnerable on the road. The statistics bear it out: motorcyclists die at 26 times the rate of drivers behind the wheel of a car and are five times more likely to sustain an injury. New Jersey’s congested highways and interstates provide too many opportunities for severe or lethal injuries to occur. Road rash, spinal cord injuries, lost limbs, and broken bones are injuries common to motorcycle riders – and fatalities are all too common. Who’s At Fault In A New Jersey Motorcycle Accident? Motorcycle riders are uniquely vulnerable in the court of public opinion: the broad assumption that bikers are to blame for the accidents that befall them can lead to unfair and discriminatory treatment by insurance companies. The margin for error is slim, and cars have the weight and size advantage. Car and truck drivers also have blind spots that motorcycles and the people who ride them do not – this can cause a motorcycle to be easily missed. The most common types of accidents that motorcycles are involved in include head-on collisions, collisions with cars making left-hand turns, motorcycle lane splitting, collisions between motorcycles and fixed objects like abutments and medians, road hazards, and the high speeds that can be achieved by sport and supersport motorcycles. Insurance companies have teams of legal experts on their side whose sole job is to get you, the injured party, to accept their first – and lowest – settlement offer. Because your settlement will have to cover all of your current and future medical costs, as motorcycles insurance policies do not contain provisions for payment of medical bills, lost wages, and compensation for the pain and suffering the accident caused you, gather the facts and make an informed decision. Consult an experienced Motorcycle Accident Lawyer at Birkhold & Maider, LLC’s for a free case evaluation can clear the path to restoring your health and getting back on your bike. The post-accident challenges can be daunting, but you don’t have to go it alone. Our best competent and compassionate team of lawyers can help you seek the compensation you need and deserve so that you can move on with your life. Don’t bear the burden of dealing with medical bills, insurance companies, and other interested parties alone. You focus on your health – we’ll focus on your case. 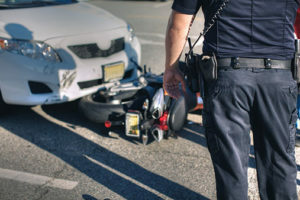 An Essex County Motorcycle Accident Lawyer at Birkhold & Maider, LLC, serves injured parties and their families in many jurisdictions across New Jersey. We serve clients in many townships and jurisdictions across New Jersey including Newark, Belleville, Paterson, Clifton, Passaic, East Orange, Bloomfield, Nutley, and other townships in Essex, Passaic, Bergen, Union, and Middlesex Counties, and beyond. Contact us for more information on the areas we serve.